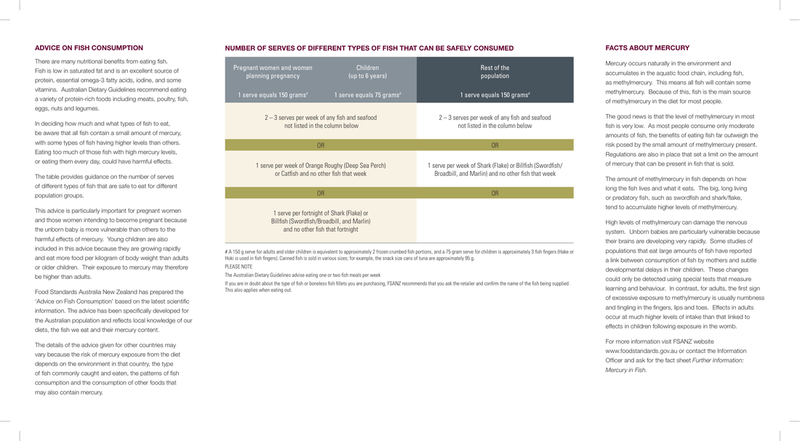 Published 16 January, 2019, the EAT - Lancet commission has authored a justification for global dietary transformation. I've attached the peer reviewed paper below and a summary can be seen on the blog page. What happens beneath the waves stays beneath the waves. Right? 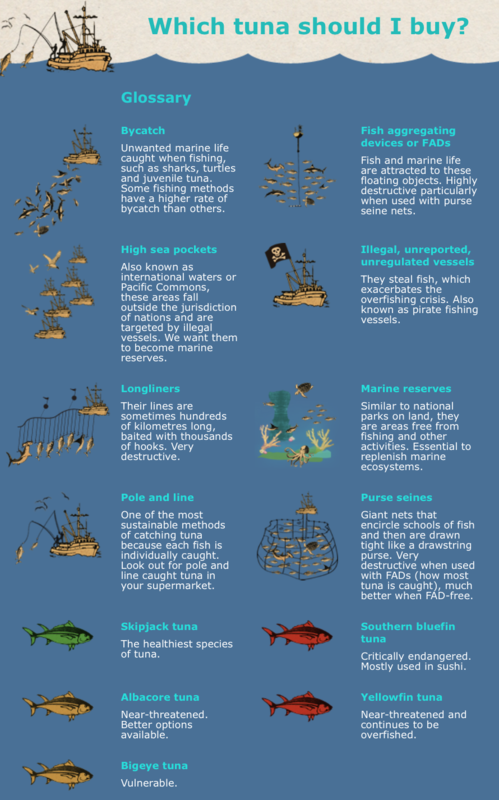 Us landlubbers do not see what happens out at sea and are mostly oblivious to fish stock levels and the environmental impact of fisheries. We don't usually know if our dinner was pole and line caught or purse seine netted. We're not even really sure what we are buying at times - Is that Orange Roughy or Deep Sea Perch? And let's be real here. 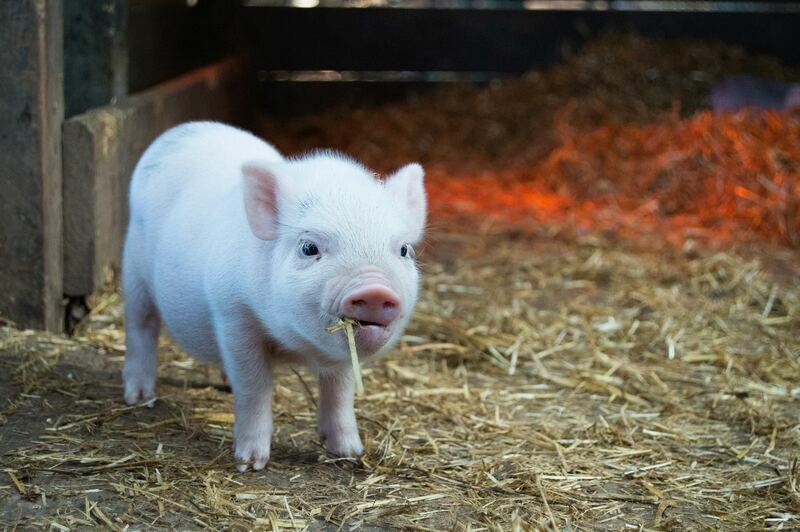 Fish aren't cute like piglets. 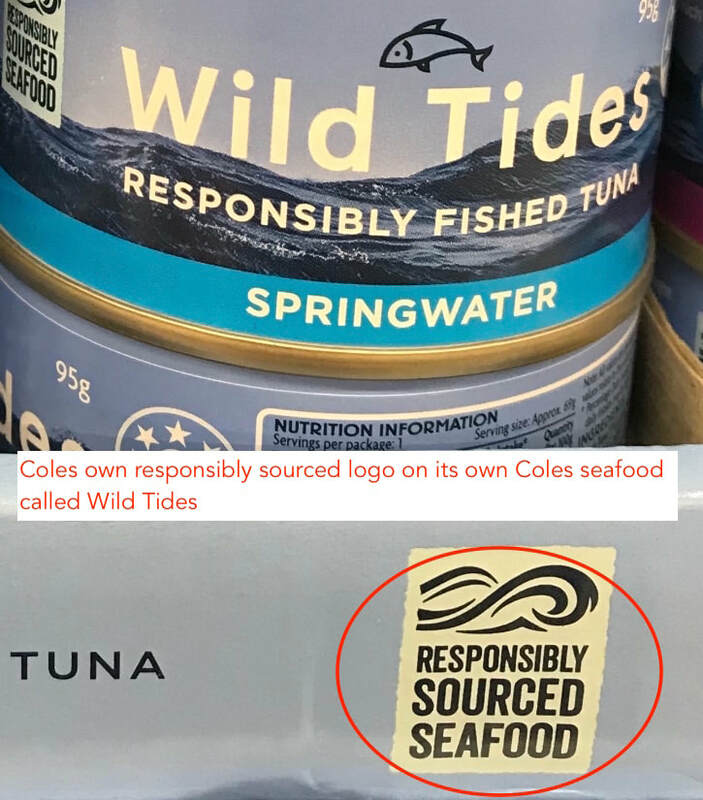 In all honesty, it was Dolphins that first made us sit up and look at our responsibly fished tuna choices, not the actual threatened fish species. By-catch of Turtles, whales, seabirds and dolphins still affect our salty dinners but it's time to take a good hard look into the clear blue sea at what is actually happening under the waves. 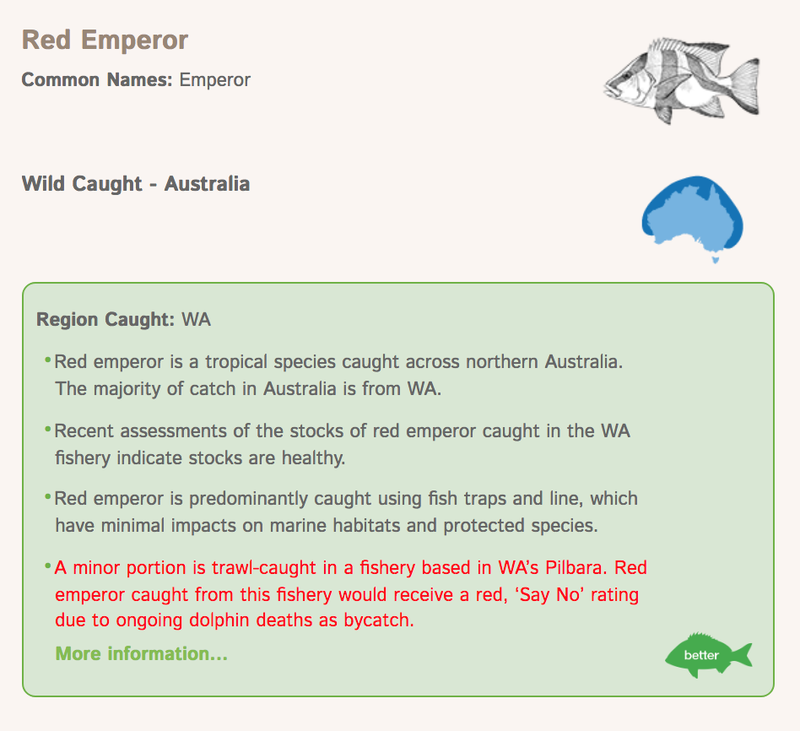 There are regulations for the naming of fish sold in seafood shops. 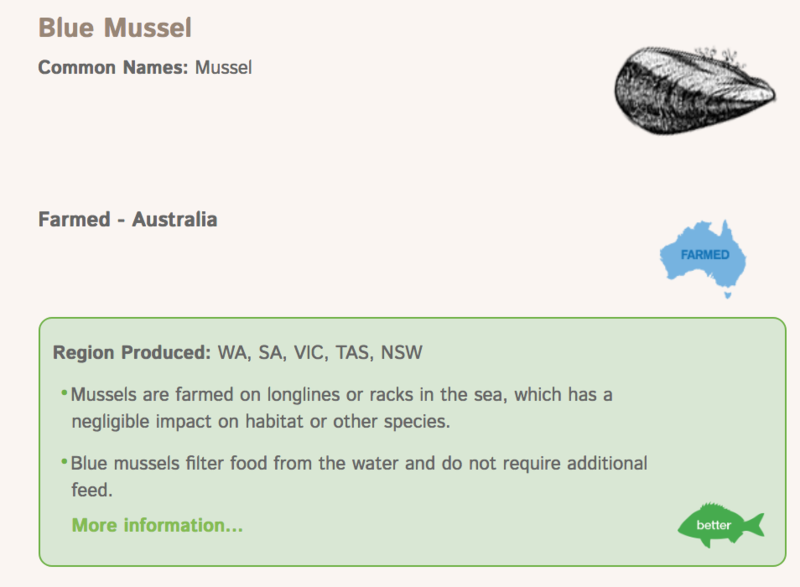 This regulation is not adhered to by all seafood retailers. This creates confusion. There is no regulation as far as I am aware for the source of the seafood to be displayed. This adds more confusion. 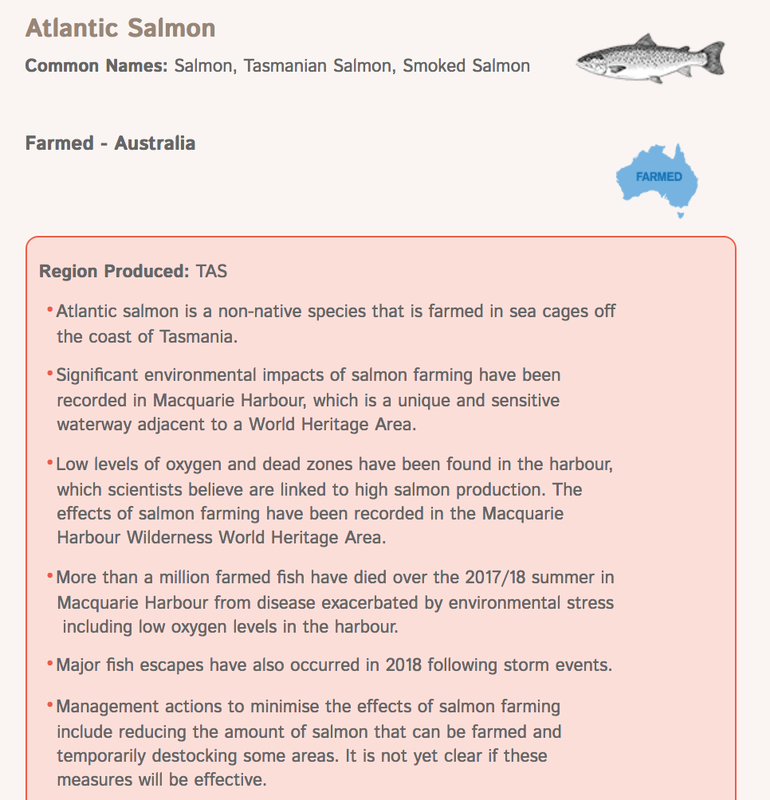 Thanks to Organisations such as Greenpeace, The Australian Marine Conservation Society (AMCS), The Marine Stewardship Council (MSC) and Activists such as Matthew Evans, we are now much better informed about what is happening in our oceans and what's for sale in our fish shops. If you would like to know more, the What's the Catch series reveals some rarely known truths and helps educate on better seafood choices. 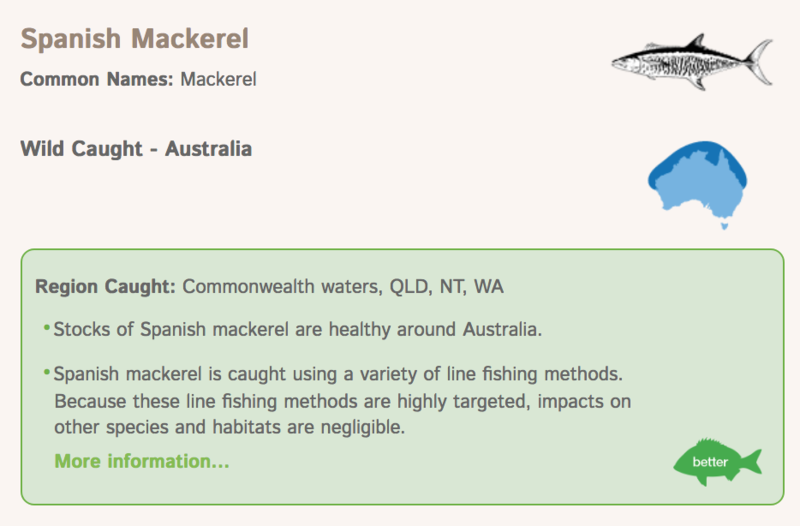 The most easily identifiable sustainable seafood carries a big blue certification (pictured above.) 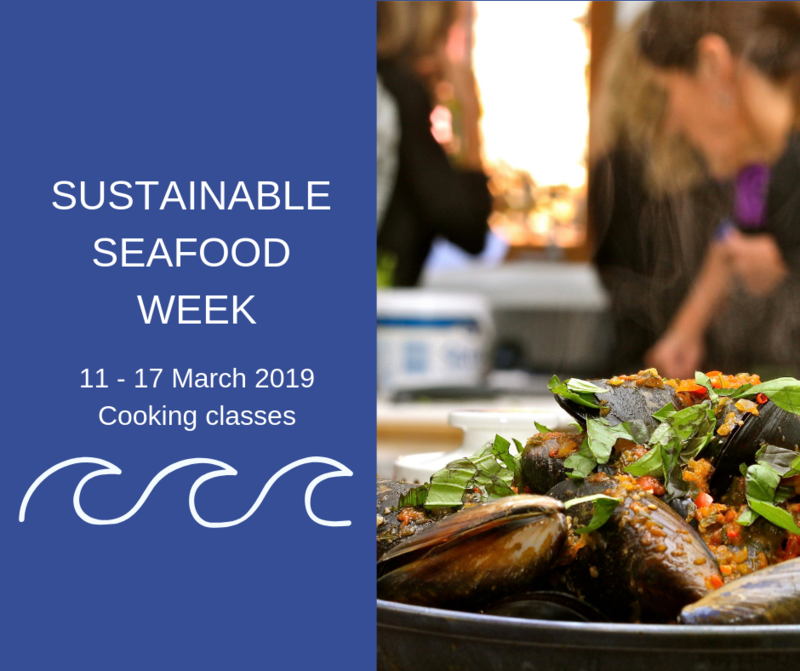 The MSC certified sustainable seafood logo. 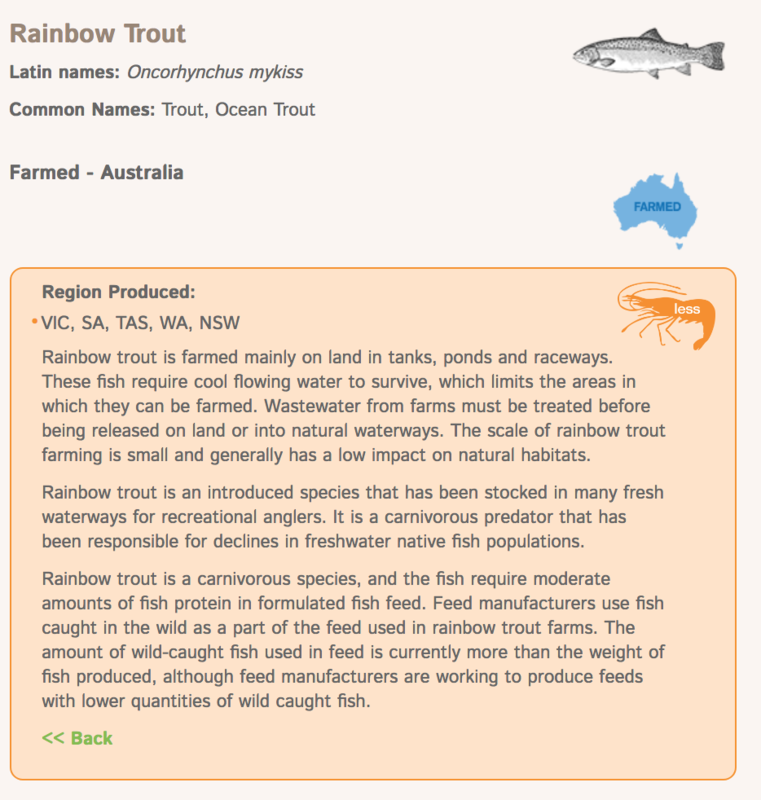 Fresh wild caught seafood that is MSC certified should be labeled as such. You can ask your fishmonger for MSC prawns, fish etc. The more of us who ask, the more likely our retailers are to supply us with what we want. Don't be fooled by imitation certification logos. See below for more. 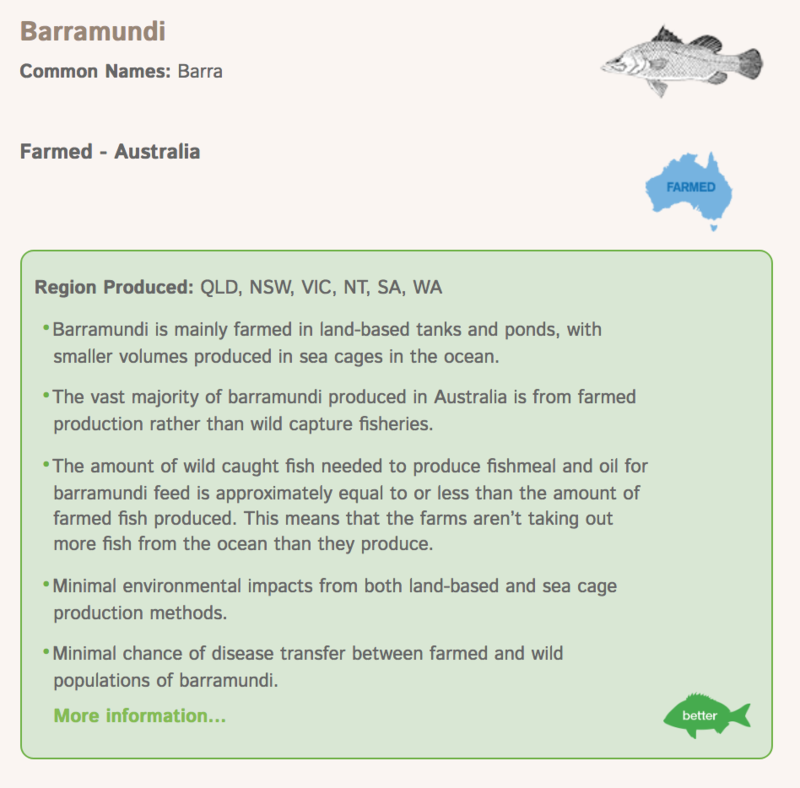 There is a wonderful Sustainable Seafood guide, developed by the AMCS that helps you to choose the most sustainably caught seafood. 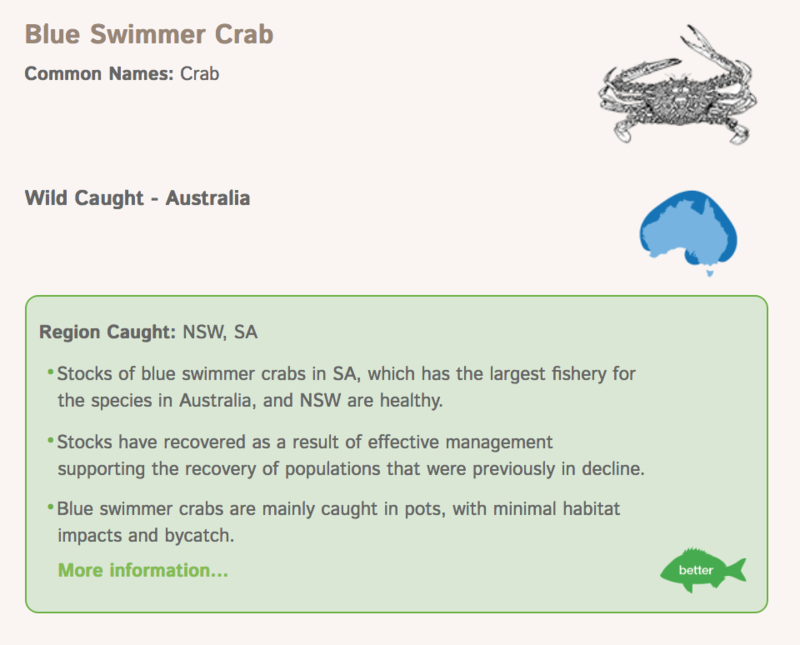 It categorises seafood into 3 groups. Green = Better Choice. Yellow = Eat less. Red = Say no. This downloadable app is a user friendly eye opening tool. The aim of the guide is to help you to make better consumption choices and to encourage fisheries to be more sustainable and transparent. 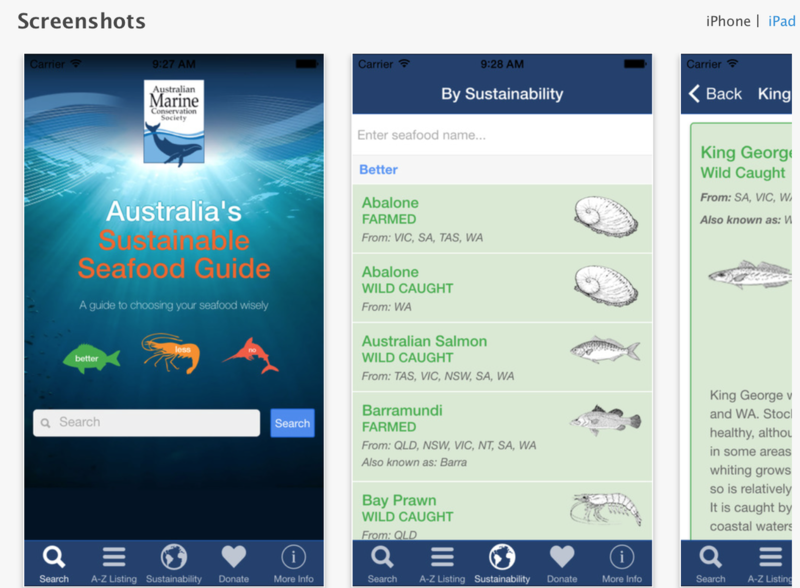 This fact rich app is fabulous but as a consumer, it can still be tricky to actually find the seafood you are after. 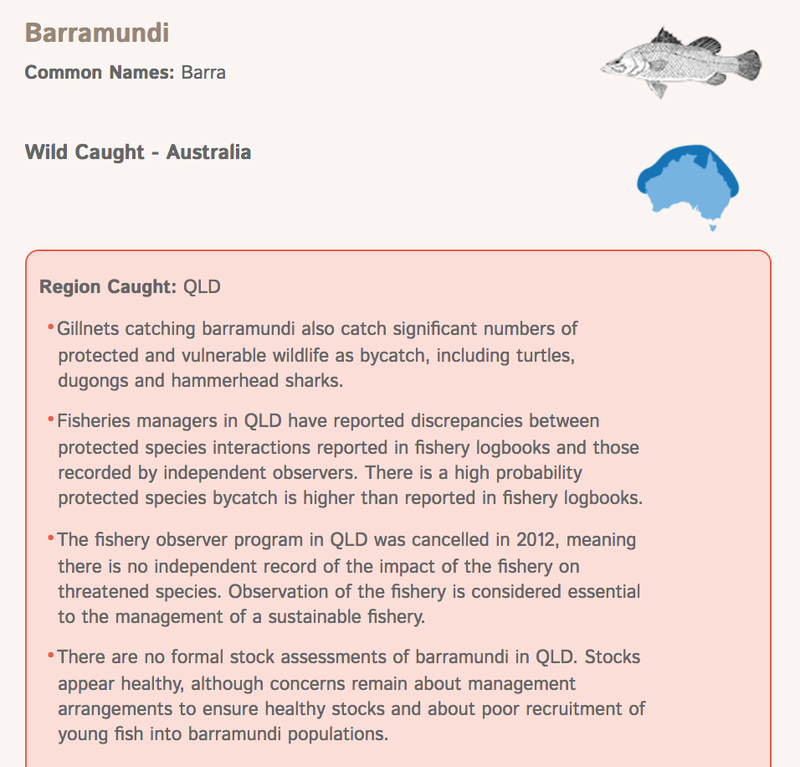 Labelling is still not great, so you have ask your fishmonger where the fish comes from eg Is it Wild Barra from Qld (Say no) Wild Barra form NT or WA (Eat less) or farmed Barra (better choice) (as at February 2019). 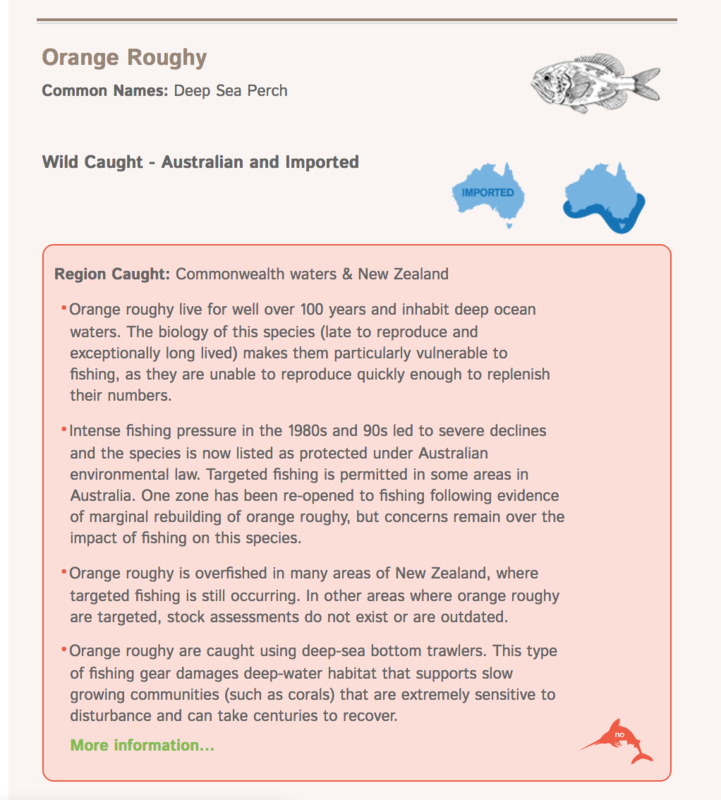 PS Orange Roughy, often sold as Deep Sea Perch is a long lived, deep sea fish. What is sold in fish shops is often 100 years old and contains high levels of mercury. 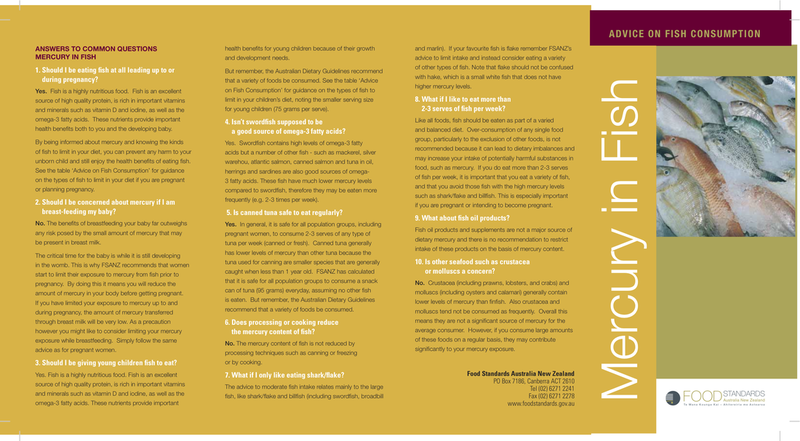 There's a guide to eating mercury containing fish at the bottom of the page, especially important for pregnant women and young children. 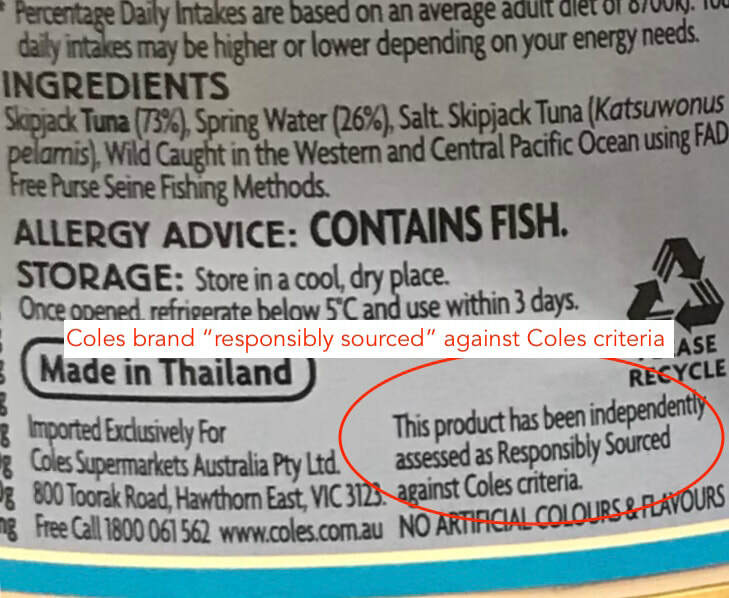 Don't be tricked into thinking supermarket's own "responsibly sourced" logos are nationally accredited. Know your MSC certification logo. Many thanks to the organisations that keep us motivated and thinking. ​Greenpeace - Keep up to date with current environmental issues. Coverage on issues that need our attention and our action. 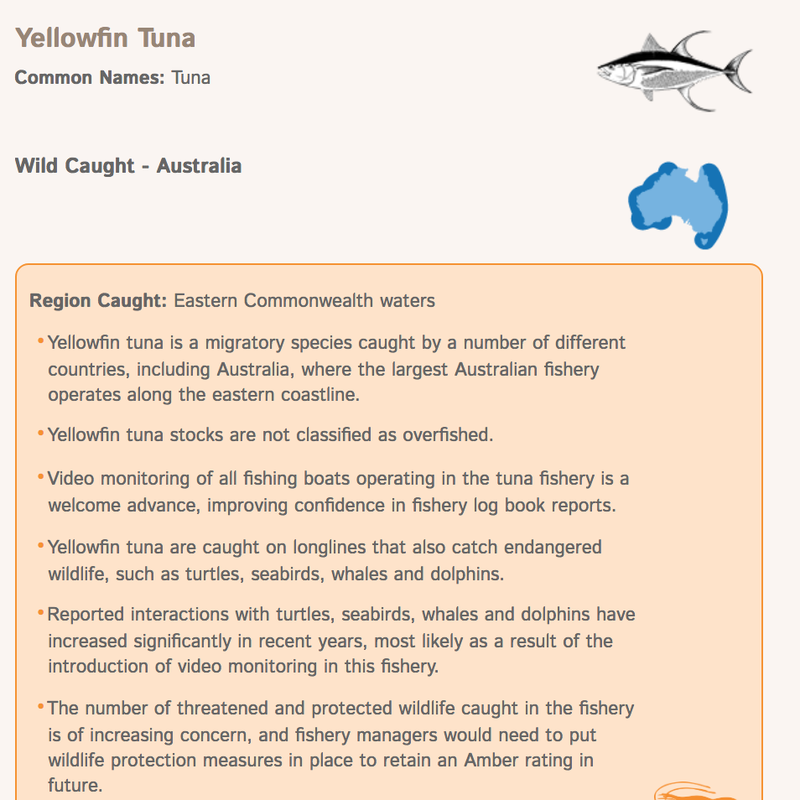 Your canned tuna guide above tells you all you need to know about which companies' tuna is the most sustainable. Click on the picture for a full explanation. 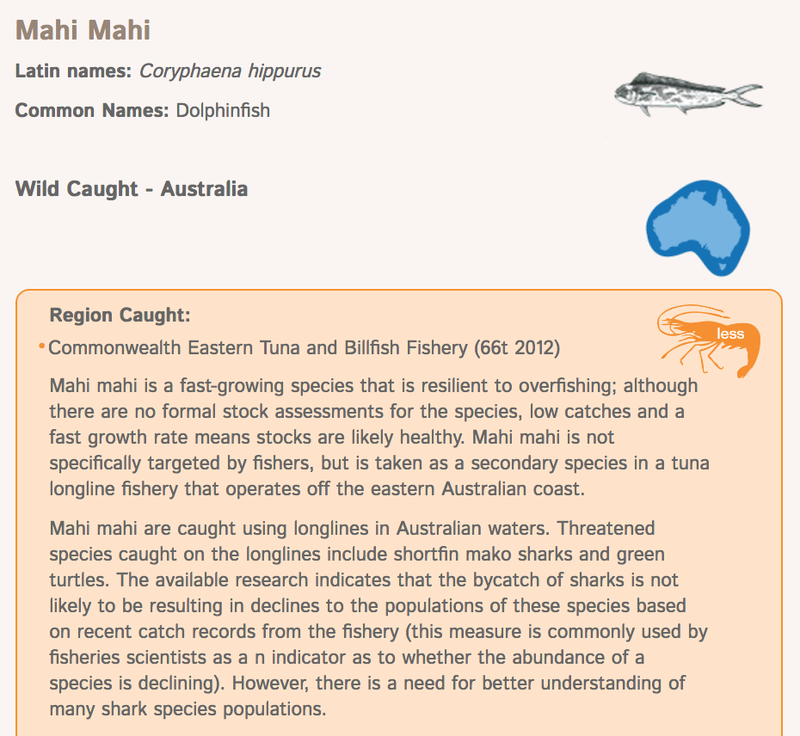 The Australian Marine Conservation Society has produced a sustainable seafood shopping guide and whilst it's a bit confronting at first (not much in the ocean is sustainably fished), it does make you think about which fish will be around for our kids and grandkids if we do not act. 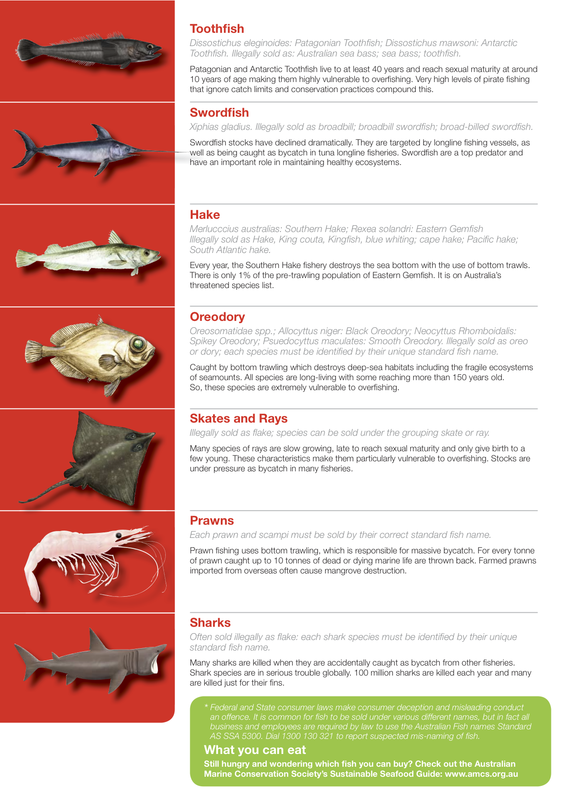 I get a lot out of using this guide and most importantly I think is to decrease your reliance on one species. 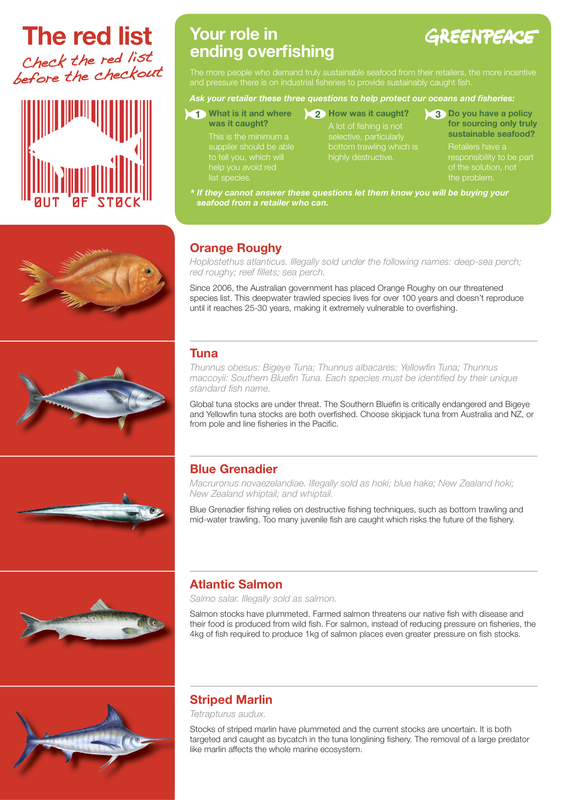 Check out your favourite fish and if it's classified red and you really don't want to give it up, think about changing it to a sometimes or special occasion meal and replace it with a "better choice" option.